Around 300 people, mostly neuroscientists, attended “Brain Technologies: A Brave New World?” We heard presentations on ground-breaking new technology to replace missing limbs, and to treat stroke, epilepsy, Parkinson’s disease, disorders of consciousness, and even eating disorders. 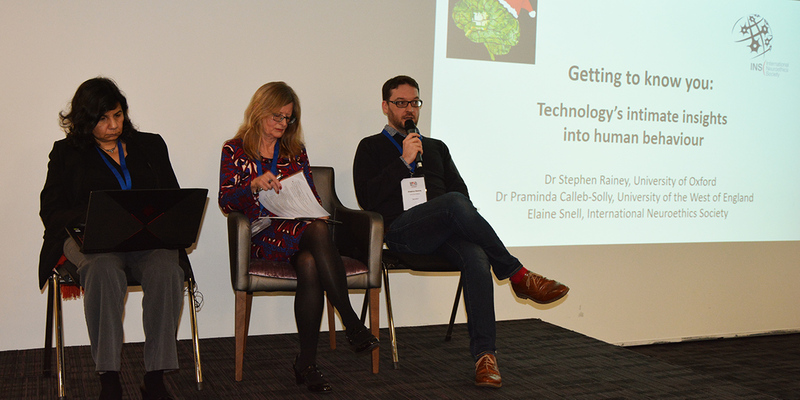 The day ended with the INS session entitled, “Getting to know you: Technology’s intimate insights into human behaviour,” chaired by Elaine Snell. Dr Stephen Rainey, Research Fellow at the Oxford Uehiro for Practical Ethics, described BrainCom, which aims at developing neuroprosthetics for speech. Praminda Caleb-Solley, Associate Professor in Independent Living Systems at the University of the West of England, talked about assistive technology for elderly and disabled people. The presentations led to a lively discussion with the audience on some of the ethical issues associated with these devices, such as replacing human care, interpretation and use of the data acquired by the technology, and whether we are compromising individual agency and freedom.